Two years ago, I abandoned my quest for the perfect tomato sauce recipe because I found it in a jar. It is Cucina Antica Spicy Arrabbiata, par excellence thanks to robust flavor, whole ingredients, and absence of excess sugar or salt. I use it for everything, from chicken parmigiana to Shakshouka. At the Greenmarket, gourds, pumpkins, and Indian corn carouse Autumn’s arrival front and center, but I couldn’t help notice the cornucopia of late-season tomatoes, ripe and bursting in a myriad of shapes and size, that populated the tents. As excited as I was to jump on the season’s first delicata or acorn squash, I knew these guys would stick around for months, while the tomatoes were approaching final harvest. A raw preparation seemed to a la summer, and I craved a slow-cooked concoction. As I surveyed the rest of the produce, picking at my ratatouille sample courtesy of National Gourmet Institute, it came to me. I would make a ratatouille-inspired marinara sauce! A fabulously chunky, tomato-based fusion of early Fall’s best offerings: slow cooked tomatoes, carrots and red peppers; riddled with fresh basil and thyme. Part French country, party Italian basic. 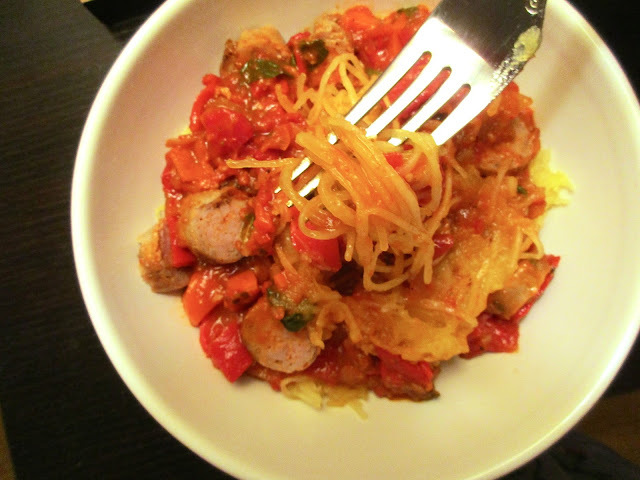 The sauce would dress spaghetti squash noodles, and accompany DiPaola Turkey Farm hot turkey sausage. I used Mollie Katzen’s Moosewood Italian Tomato Sauce for the basic recipe, and the end result was outstanding. The carrots and peppers added a sweet, complex flavor to the late season tomatoes, so that the sauce felt unique and interesting without straying too far from a classic marinara flavor. Notes of hot red chili and fennel from the sausage added a burst of heat to the mild sauce. The red sauce is a bit time consuming, which is why I fervently recommend you gather a giant haul of market tomatoes and make a huge batch at once. It will keep in the refrigerator for over a week, and in the freezer indefinitely. If you are a vegetarian? 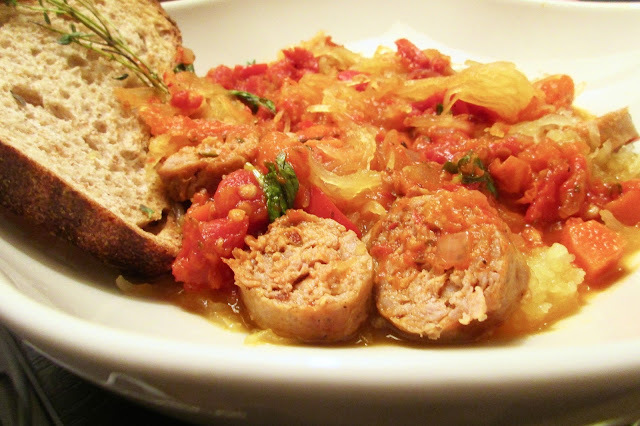 Substitute cannellini beans for turkey sausage. If you are feeling creative? Add late summer squash, sundried tomatoes, capers, or olives to the mix. If you are lazy? Sautee onions, carrots, red pepper, garlic, and thyme for eight minutes. Add it to your favorite jarred tomato sauce. If you are in a time crunch? Substitute spaghetti squash noodles for zucchini noodles, which take only minutes to cook. If you are human? 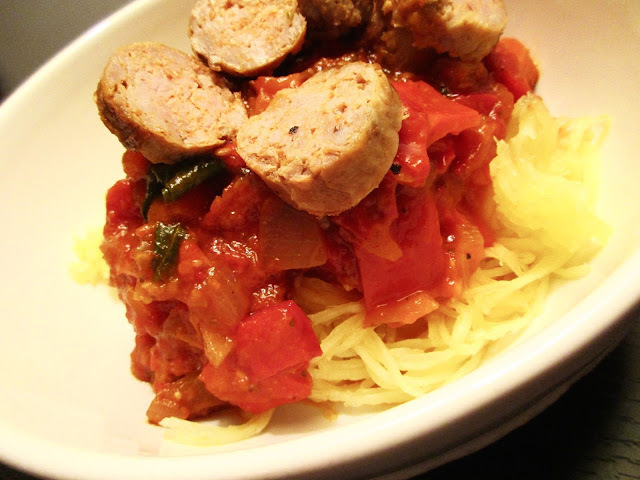 You can’t deny the undeniable power of a good spaghetti and meatballs…consider this its evolution of sorts. A healthier, more flavorful, locally-sourced cousin of everyone’s beloved classic dish. 1. Preheat oven to 400 degrees. 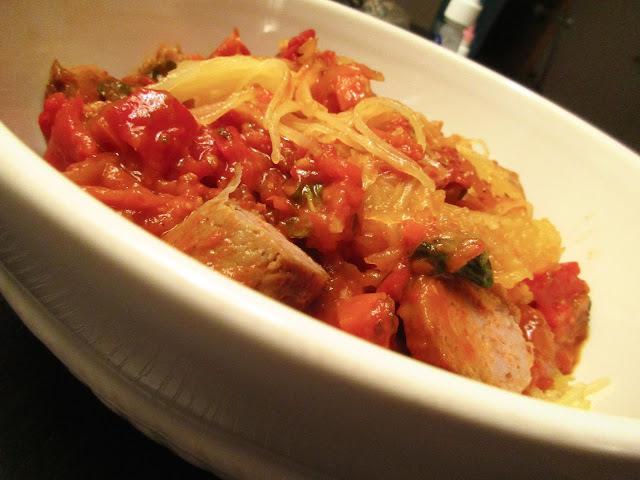 Cut the spaghetti squash in half, lengthwise, and place (cut sides down) on a baking sheet covered with aluminum foil lightly coated in olive oil. Bake for 45 minutes. 2. 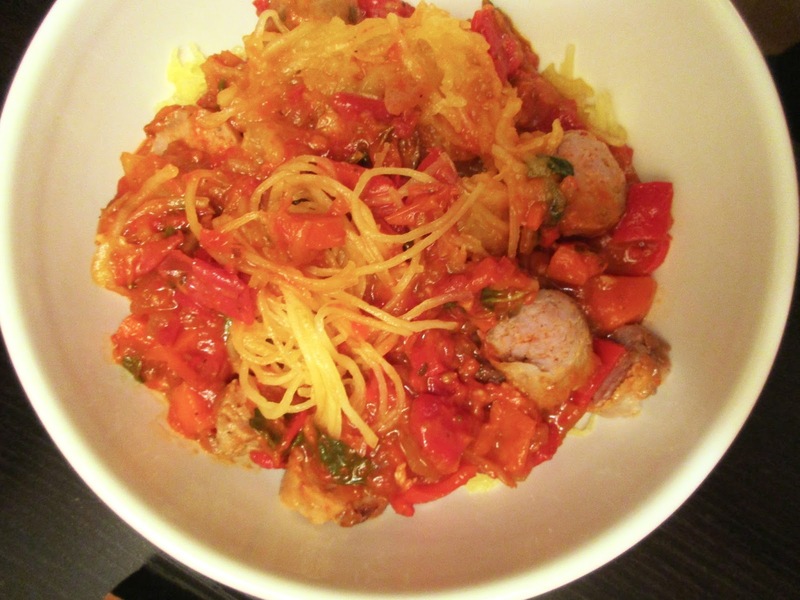 While the spaghetti squash is cooking, prepare the sauce. Heat olive oil in a Dutch over or large skillet. Add onion, pepper, carrot, thyme, oregano, and 1 tsp salt. Sauté over medium heat until the onion is soft, 8 to 10 minutes. 3. Add tomatoes, tomato paste, wine/honey/sugar, and black pepper. Bring to a boil, then lower heat and simmer, partially covered, for 20 to 30 minutes. 4. While the sauce is simmering, cooking the sausage. Heat 1 Tbsp olive oil in a medium sized skillet, and cook sausage, turning frequently until it is browned on all sides and cooked through in the middle, about 10 minutes. Set aside. 5. Add garlic to the sauce, and cook about 10 minutes more. The sauce will have a loose, chunky consistency, but if you desire a more uniform thickness, take an immersion blender to the pot once it has cooled a bit. Stir in basil leaves. 6. 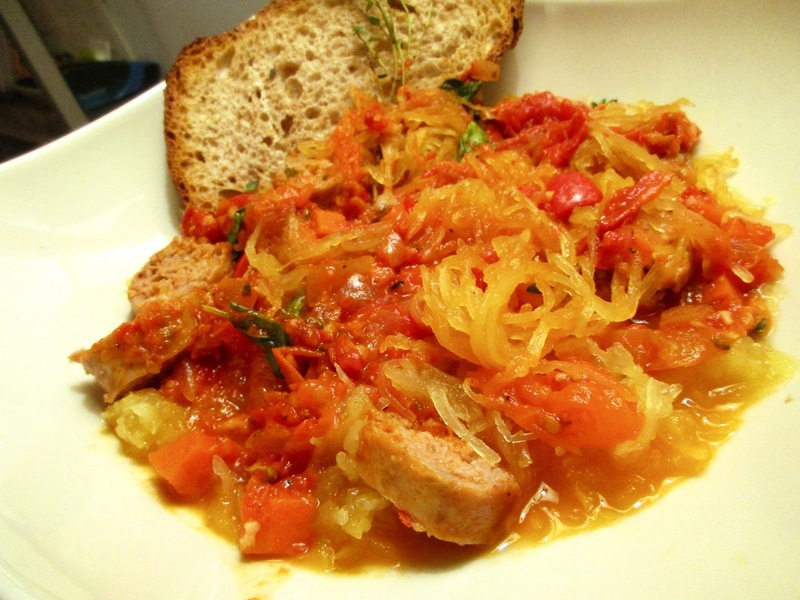 To serve: scrape out the seeds of the spaghetti squash and discard. Using a fork, scrape out the flesh of the squash—it will dislodge in spaghetti-like strands—distributing evenly amongst four plates (each squash half serves two). Top each plate with two heaping spoonfuls of sauce, and turkey sausage cut into pieces of ½ inch thickness. Garnish with extra basil or thyme, and enjoy with a side of thick, toasted whole grain bread.